Acne is one of the most common skin disorders and will affect almost all of the adolescent population at one time or another. Due to hormonal changes, acne normally starts in the early teen years and peaks between the ages of 16-20. It can persist into a persons 20’s and occasionally until the age of 50. 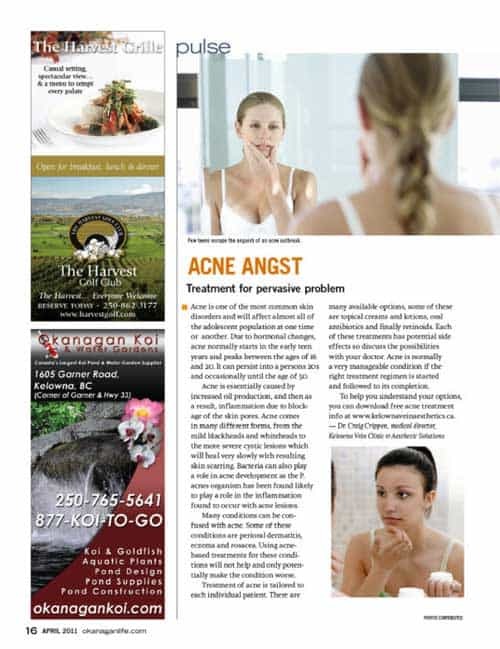 Acne Angst is the stress related to having acne vulgaris breakouts when you don’t really want them. Acne Angst can be found in adolescents as well as adults who feel that they are now too old to have acne breakouts. Acne is essentially caused by increased oil production, and then as a result, inflammation due to blockage of the skin pores. Acne comes in many different forms, from the mild blackheads and whiteheads to the more severe cystic lesions which will heal very slowly with resulting skin scarring. Bacteria can also play a role in acne development as the P. acnes organism has been found to likely play a role in the inflammation found to occur with acne lesions. Many conditions can be confused with acne. Some of these conditions are perioral dermatitis, eczema, and rosacea. Using acne-based treatments for these conditions will not help and only potentially make the condition worse. Treatment of acne is tailored to each individual patient. There are many available options, some of these are topical creams and lotions, oral antibiotics and finally retinoids. Each of these treatments have potential side effects so these must be discussed beforehand with the patient. Acne is normally a very manageable condition if the right treatment regimen is started and followed to it’s completion.